Shippo has been controlled by the parasite pupa! He has turned cruel and is wrecking damage! What a headache! The villagers are furious! If we don't find him soon, he'll be exterminated! Idiot! Your fox fire is just hot, and can't do damage to me! Heheh...! I have more tricks up my sleeves! 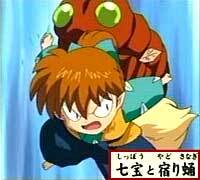 Next on Inuyasha, "The Strongest Enemy: Parasitic Pupa Shippo". Why is this idiot only attacking me?! Don't sneak up behind me, idiot! If you're scared, be a good boy and just faint. I'll hit him fifty times to wake him up! This isn't about hitting him fifty times! Don't say something so disturbing! 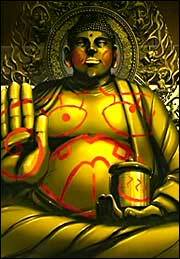 …Shippo drew a face on the belly of the Buddha statue, and a 'Hot Spring' sign on the jar that it is holding? 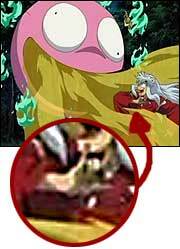 …Inuyasha giving a 'I love you' handsign when he was attacked by Shippo's stink pellets? KAG: Shippo has turned into a menace! Our greatest enemy is the one closest to us! Inuyasha versus Shippo, an unavoidable battle now begins!